The Doberman pinscher is a versatile and agile dog. 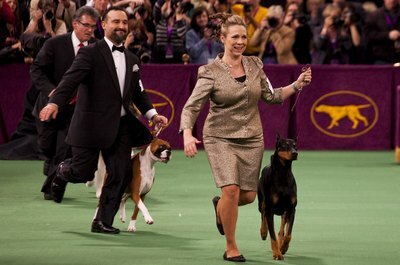 Tall, lithe and active dogs, Doberman pinschers would seem ideal agility competitors. Not all Dobermans would agree with this notion, preferring to be tall, lithe and active in their own way (See References 1, Training and Obedience). Train your agility Doberman by starting your puppy and keeping him motivated (and don’t stress about the weave poles). Mature Dobermans are large, powerful, high energy dogs. It is important that they learn good manners from the moment they step into your home and continue to learn over their lifetimes. Training your puppy with some agility skills will help them harness some of their curiosity and energy, and put it into positive activities. It is best not to train your puppy to jump or climb obstacles until his growth plates are closed in his legs. Dobermans stop this kind of upward growth at about 12 months of age. However, until this time your puppy can learn stationary skills needed for agility, such as targeting and stays, as well how to go through tunnels. Your puppy also should learn his name and how to return to you when called. Once your Doberman has grown to his mature height, he can be started over low jumps. He also can learn how to climb the full-sized equipment that he will be using in competition, should you choose to compete. Before you start training your Doberman in earnest, be sure to take him to your veterinarian for a complete physical checkup. Dobermans are prone to many physical ailments, including Dancing Doberman Disease, hip dysplasia, Wobbler’s disease, and cardiomyopathy. You will want to be certain that your Doberman is free of all health issues, or that they are under control before continuing. Your Doberman puppy loves praise. However, praise might not be enough to motivate him over an obstacle or onto a teeter totter. 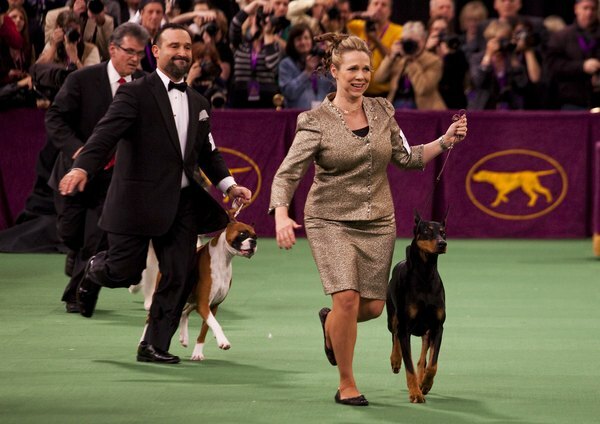 Praise, food treats and toys or balls all have their place in agility training your Doberman. Keep in mind that food treats will tend to keep your dog close to you or to a piece of equipment, depending on whether you feed him from your hand or from a target dish. Toys and tennis balls can be used as motivation or rewards from a distance. Mastery of the weave poles is based on muscle memory. Your dog must be able to look ahead to the next obstacle while maneuvering his body successfully through the weaves. More than every other agility obstacle, success at the weave poles depends on training your Dobie for at least several minutes daily. Fortunately, you don’t need fancy equipment to practice at home. Simple weave poles can be simulated by using stake-type driveway reflectors, and jumps can be simulated by placing poles on top of bricks or cinder blocks. When using simulated equipment at home, however, it is helpful to enroll in an agility training class to expose your Doberman to regulation equipment.